Insect-eating birds are in decline in parts of the Netherlands where farmers have used pesticides that are suspected of killing bees vital to crop pollination, a study showed on Wednesday. The report is the first evidence that neonicotinoid pesticides, restricted in the European Union because of worries about bees, are having knock-on effects on larger creatures by reducing insect prey such as mosquitoes or beetles. Barn swallows, starlings, mistle thrushes and tree sparrows were among birds whose numbers had declined most in areas of the Netherlands where a type of the insecticide had been heavily used, according to the study, which was published in the journal Nature. “To our surprise we did find a very strong effect” on birds, the lead author, Caspar Hallmann of Radboud University in the Netherlands, told Reuters. Nine of 15 bird species studied only eat insects and all feed insects to their young. “We cannot say this is proof (that the pesticide causes the decline in bird numbers) but we cannot explain the … decline of birds by any other factors,” Hallmann said. The study looked into other possible causes, such as pollution, he said. The European Union decided in April to impose a moratorium on three neonicotinoids for two years on flowering crops because of fears they are harming bees, which are vital to pollinating crops. The pesticides can still be legally used in the European Union on non-flowering crops such as barley and wheat, the scientists said, and are widely used in many other nations. Producers of the pesticides, mainly Germany’s Bayer and Switzerland’s Syngenta, have contested the moratorium. They suspect that other factors, such as a virus spread by a parasitic mite, are behind the “colony collapse disorder” which has seen bee numbers drop in Europe, Asia, the Americas and the Middle East. The Dutch study said that future legislation should take account of the wider impact of pesticides on wildlife. Pesticides that keep insects at bay protect crops worth billions of dollars as food for people, even if they limit bird numbers. Hallmann said he did not know if bans were needed. “We’re ornithologists, we’re not toxicologists and not politicians. We want to work together to find a solution,” he said. 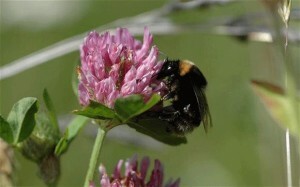 Dave Goulson of Sussex University wrote in a commentary in Nature that the study was “the first to provide direct evidence that the widespread depletion of insect populations by neonicotinoids has knock-on effects” on larger animals. Other animals, such as shrews and bats, also rely on insects.